This stunning space wallpaper from the VLT Survey Telescope at ESO’s Paranal Observatory in northern Chile shows the globular cluster Messier 54. This cluster looks very similar to many others, but it has a secret. This stunning space wallpaper from the VLT Survey Telescope at ESO’s Paranal Observatory in northern Chile shows the globular cluster Messier 54. This cluster looks very similar to many others, but it has a secret. 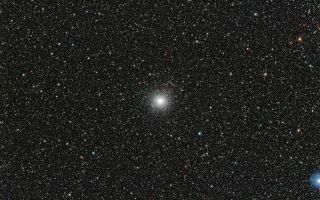 Messier 54 doesn’t belong to the Milky Way, but actually is part of a small satellite galaxy, the Sagittarius Dwarf Galaxy. This unusual parentage has allowed astronomers to use the Very Large Telescope (VLT) to test whether unexpectedly low levels of the element lithium in stars are also found in stars outside the Milky Way.